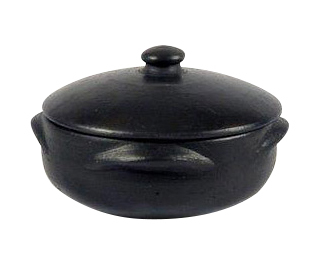 DESCRIPTION: Brazilians have been using these clay pots for hundreds of years. Since they are handmade from only natural substances the cooked food actually tastes much better than it does with traditional cookware. They can be used on the stove top or in the oven. At the table, they make ideal serving pieces since they provide an exciting accent to your service and remain hot for an exceptionally long period of time. CURING THE POT: Prior to the first use only, wash the pot using a sponge with non-detergent soap and water. When dry, rub all cooking surfaces and the inside of the lid with cooking oil. Place in a pre-heated oven for 10 minutes. Remove. Allow to cool. Re-wash with soap and water. Next, pour in ½ cup of cooking oil and fill the rest of the pot with water. Place on the stove at medium heat. Allow the water to boil for 15 minutes. Let cool. Wash normally. Do not place the hot pot directly on top of the cold counter. Always use a trivet to protect the surface from the heat. NOTES: Do not use as a dutch oven nor store food in the pot. After each use, allow to cool and wash with warm water. We recommend the use of a wooden spoon only. Do not subject to thermal shock. Hand wash. Do not use in microwave.